When it comes to emergency preparedness, one of the most important steps- and often one of the most overlooked- is creating an emergency water supply. The importance of water really can’t be overstated- just a loss of 10-20% of body weight in water would prove fatal. The human body can go weeks without food, but only days without water. After ensuring you have clean air to breathe, a water supply is the next important step in becoming prepared. How much water you should save comes down to how long you want to prepare for, and how comfortable you want to be. The bare minimum should be at least 1L (slightly more than 1 quart)/person/day, for AT LEAST a 3 day period (in most emergencies, help is able to arrive within 3 days). At least 3L per person saved should be a must in every household, considering how cheap and easy it is to prepare and how extremely important it is. If you want water for washing and cleaning, consider storing 2-3L per person. For longer term storage, you’ll want even more water, up to 4L/person. While you can skimp on washing and cleaning for that first week, over longer periods proper hygiene becomes an important factor for overall health. When it comes to water you really can’t have too much, so if you have the space consider storing as much as you can. 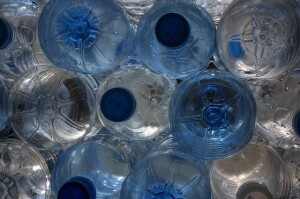 The easiest option for water storage is bottled water. It’s safe and reliable, already packaged, and has the shelf life printed on the side of the bottle. It can be relatively expensive, though, considering there’s a virtually free source of water coming from your tap. If you don’t want to overspend on bottled water, and have some extra time, you can create your own emergency water supply with discarded plastic bottles. 2L pop bottles work great. Remember to avoid anything that’s had milk or juice in it, though, as fats and sugars can be difficult to fully remove, and can be a breeding ground for bacteria. To clean out an old bottle, first add soap and water and swish it around. Then add water and a teaspoon of unscented household bleach, and swish around. Empty, and rinse thoroughly. Fill the bottle with tap water. If your tap water isn’t treated with chlorine, add 2 drops of beach. If it is, that should be enough. Screw the cap on tightly, and you have water ready for storage! Store your water in a cool, dark place, away from any fuels or pesticides that could permeate the plastic. Cover it with something dark, like a black garbage bag, to avoid any contact with sunlight. Inspect every 6 months for leaks or changes in color. You’ll want to rotate your water, as its shelf life will be about a year. When it comes to having a water supply in an emergency, the best thing is to have a stash put away before hand. Sometimes though, you may not have one available to you. Or maybe your initial supply has run out. Either way, there may be times when you need to find a natural water source and use that to drink. You’ll want to find a stream, river, lake or well. Start with the cleanest, salt-free water available to you, and remember cold and running water is better than warm and stagnant. But don’t drink that water just yet! There are all kinds of nasty things living in it that could potentially make you very sick. We’ll need to remove them if we’re planning on drinking the water. There are 2 kinds of contaminants we need to watch out for: pathogens and pollutants. The largest pathogens are protozoa, which include parasites such as Giaridia Lamblia and cryptosporidium. Bacteria are medium-sized pathogens, including E coli, cholera and salmonella. The smallest pathogens are viruses, such as Hepatitis or Polio. All are nasty stuff, with the potential to make a person very sick or even kill them. Pollution is self-explanatory- any non-living substance that can be harmful to the human body. Chemicals and sewage fall into this category. To eliminate these contaminants, we need to put the water through a 2-step process: Filtration, then purification. Filtering water eliminates the larger contaminants from water. The largest particles can be removed simply by straining with a clean cloth, paper towel or coffee filter. For the smaller stuff, we’ll need to use a stronger filter. Ceramic filters are the best on the market, but also the most expensive. They have the smallest pore size, and are used by the Red Cross and World Health Organization. Glass fibre or compressed surgical paper filters are the next best kind, and are much cheaper. Hard-block carbon filters have larger pores so they aren’t as good at filtering small particles and microorganisms. However, they have an added benefit of absorbing some chemicals, odours and pollutants other methods can’t. They aren’t effective on their own, but are great when combined with one of the two above. After filtering the water, you’ll need to purify it to get rid of the tiny contaminants filtering missed. Here are some effective methods of purification. Boiling water for 5-10 minutes will kill most pathogens, and it’s cheap and easy. In an emergency you may not have access to the electricity or fuel to boil water, though. A lot of the water is lost through steam as well, which is an issue if your water source is limited. Boiling is also impractical for anything but small amounts. So if boiling isn’t an option for you, consider one of these next options. Iodine is a disinfectant, cheap and very good at killing pathogens. Use the 2% solution. Add 3 drops/quart of clear water, and 6 drops/quart of cloudy water. Stir and let sit for 30 minutes before use. Iodine purified water should not be used by pregnant woman, and iodine should not be used as a long term water solution. Chlorine is another disinfectant option. It’s very poisonous though, so you need to make sure your dosages are correct. Use regular household bleach, and avoid anything with added cleaners or scents. Add 8 drops for each gallon of water, stir and let sit for 30 minutes. The water will clear, and the dirt particles will settle at the bottom. The water will have a slight bleach smell. UV lamps are another purification option. The radiation sterilizes microorganisms, making it a very effective purifier. It has the same downside as boiling though, being useless without the electricity to run it. It won’t eliminate debris, chemicals or pollutants, but makes a great 2nd or 3rd stage of purification. With all these methods, you should be more than prepared to put together your own emergency water supply. Do it. The day may come when you’re very glad you did. Water and pet food storage are my two main prepping weaknesses. Thanks for the info and inspiration. I have 55 gal.drums I will be using for water storage and understand that I need to put the bleach in at the time I add the water for longer storage. That would mean counting out a lot of drops! Anyone already have a measurement for the bleach in ounces for a container that size? I read 1/8 cup of bleach to a 55 gallon of water! This is something I have been trawling the net for, thank you so much for your advice. I have been saving my 2L pop bottles in preparation for this info. I have written it down and will be keeping about four copies. One for my kitchen, one for my bug out bag, one in a special folder i’ll keep safe and one for luck lol…..must make sure I get a few ‘Pipette’s’ too and a new Sharpie to mark the date. People don’t realize how important water is to their prep plan. Thanks for this article!